Happy Monday my friends! I hope you had a lovely weekend. I did, thanks to some much needed retail therapy! Come check out my latest treasures! Via Habitat Restore and Antique Store lighting. We put our house on the market last week and it has proven to be quite stressful. Between all of the pre-market activities such as deep cleaning and purging, we chose an agent and officially put our house on the market. The sign went up and we’ve had our first open house. So how do I calm myself during this nerve wracking process? Shop. I am always on the lookout for chandeliers and a bargain. So I found this adorable petite chandelier at an antique store. The best part? It was $29! Yes, I wish it had been the magical $20 but I know a good deal when I see it and don’t haggle when I know this. Isn’t it sweet? The chandelier is currently on a long chain and a plug but it will be simple to hardwire it. Upon further inspection, the octagonal crystals were acrylic not glass. (Yuck.) There are three arms, each with four holes for crystals and three additional loops for more crystals. I had some small vintage glass teardrop crystals in my treasure room and they worked perfectly! Better, right? I discovered a small hook on the bottom of the fixture which of course allows for another crystal opportunity. That’s always a good thing! I like the scale and size of these crystals much better. The leaves on the top could probably use a few crystals too. Hmmm. Just the addition of crystals makes a big difference. 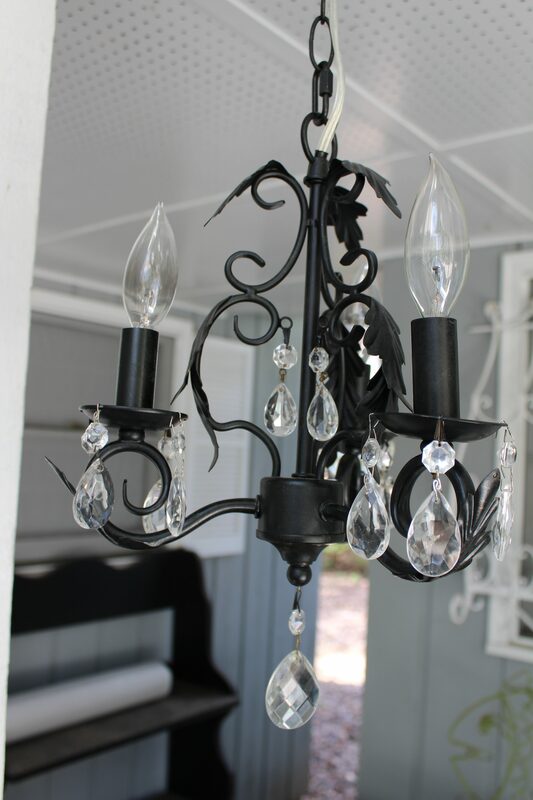 Then, I found this pretty chandelier at the Habitat Restore for a mere $20. It’s very heavy and substantial and has such great details. One of the sockets is missing so I’ll take it to my electrician and have him repair it, check the wiring and put it on a longer chain. A quick coat of Heirloom White paint and she will be good as new! Look at those details! It’s going to be beautiful! Don’t you love Habitat Restores? Switching out Light Fixtures prior to a move….